Another whimsical birthday card for a friend’s upcoming birthday. 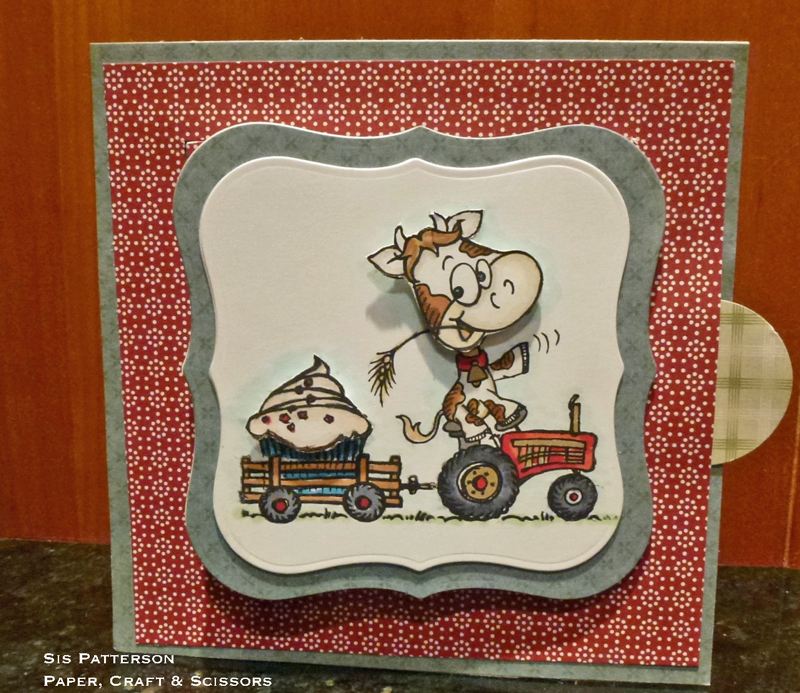 With his love of vintage tractors and appreciation for puns, this was an easy card to make. 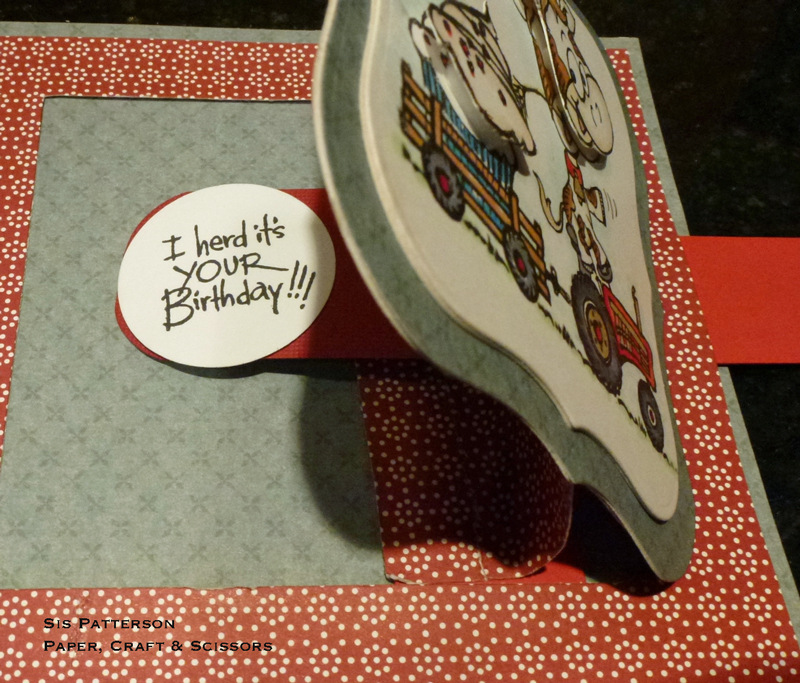 I used Stampendous Cowlik birthday for all of the stamped images and sentiments in this card. After stamping in Memento Tuxedo Black, I colored the images with Copics. The cupcake frosting and the cow head were stamped twice and trimmed. I used thin foam squares to add a little dimension. 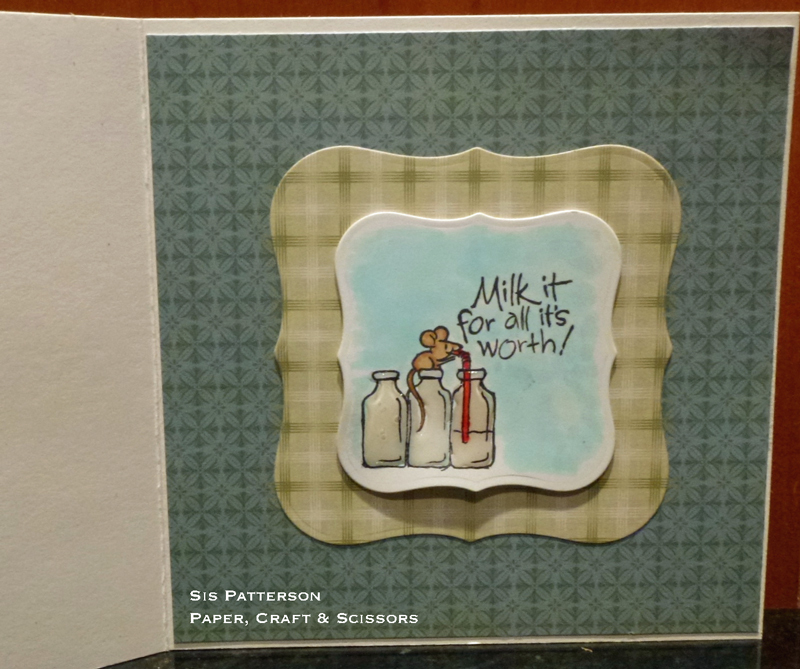 I used my Spellbinders Nestabilities for the labels – each label is mounted on chipboard base. You can find the directions to make a T-slide card at Splitcoast Stampers. I made the card according to the first set of dimensions in the tutorial. My completed card measured just slightly more than 5.25″ square. The T-slide front is adhered to a 5.25″ cardstock base. I used Spellbinder Nestabilities for the inner sentiment. The milk bottles are Glossy Accent-ed. And that it is – I hope you’ll check out the T-Slide card tutorial and make one soon. Well, you already know I love this! Piper just giggled and said, “I love it too.” He will too! Too, too cute! Love the t-slide! OMG!!!! This is tooooooooooo frickin’ CUTE!!!!!! I LOVE it!! This is so fun and adorable! I love the little cow – made me smile! As a big fan of the whimsical and punny, you got me by the heartstrings with this one. Absolutely moovelous…..you made me smile inside and out. I am moooved by your creation. lol. ok. I’ve beat the dead horse enough. I’m going, but I am leaving more charmed than when I came. Just saw your card on Nadine’s blog…So Cute! Love the design, patterns, coloring, details and the Puns!